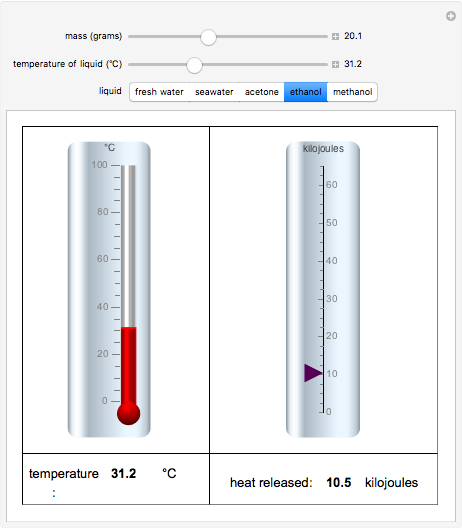 Set the initial temperature and mass of a sample of liquid to calculate the maximum quantity of heat it can transfer when its temperature changes by The process is described by the equation , where is heat transferred (J), is mass (g), is specific heat of the substance (J/g °C), and is temperature (°C). Each liquid has a characteristic specific heat. In the study  that inspired this work, a quantity of liquid was added to a massive amount of liquid nitrogen, so the final temperature winds up at 77 K ( degrees °C), whatever the mass and original temperature of the liquid. The purpose of this Demonstration is thus to clarify the conceptual difference between temperature and heat. Temperature is a measure of the average kinetic energy of the molecules in a body. Thus, temperature is an intensive property, independent of mass, while heat is an extensive property, proportional to the mass. A system does not "contain" any definite quantity of heat, but can only transfer heat along a temperature gradient. 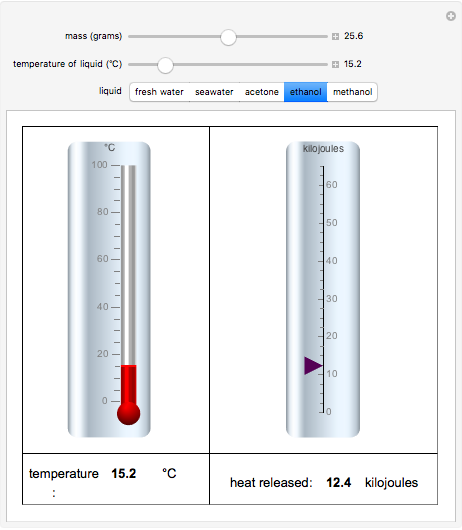 E. Vitz and M. J. Schuman, "The Paradox: Which 'Contains More Heat,' a Cup of Coffee at 95 °C or a Liter of Icewater?," Journal of Chemical Education, 82(6), 2005 pp. 856–860. doi:10.1021/ed082p856. The Engineering Toolbox. "Liquids and Fluids: Specific Heats." (Mar 23, 2017) www.engineeringtoolbox.com/specific-heat-fluids-d_ 151.html. Desi Dikova, Kaylie Sierra and Franco Szeto "Maximum Heat Transfer by Liquids at Different Temperatures"